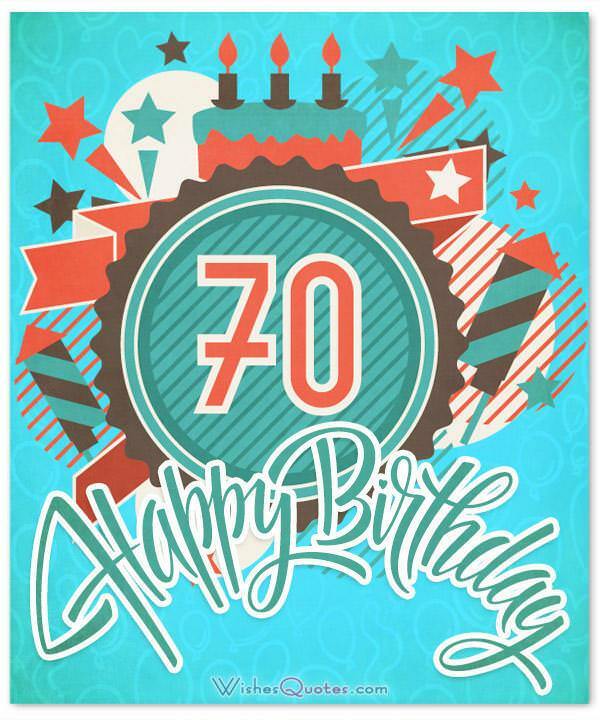 Amazing 70th Birthday Wishes to Send to your Family and Loved Ones. Caring for a 70-year old that’s close to you means caring 70 times more! 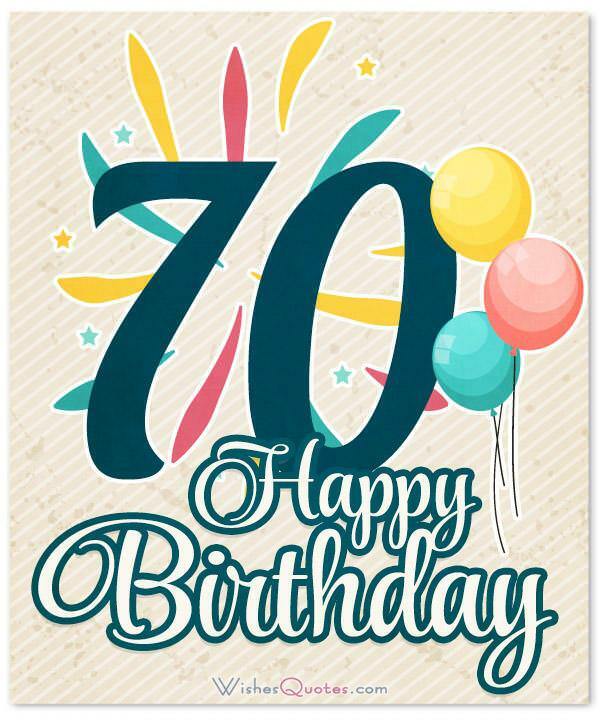 Browse our unique collection of extraordinary 70th birthday wishes that are certain to make any 70-year old out there feel amazing! Because you see, that’s the whole point of birthdays when it comes to wishes. Turning 70 is a major milestone emotionally challenging most of the times. If you actually do care, you need to show it to the other person, and what better of a way to do that than a heartfelt wish on a handwritten birthday card! But most people have a hard time going past “Happy Birthday!” and this is why we are here for! So, enjoy the best birthday wishes on the internet! You’ve been like a lighthouse to me, always showing me the correct way, guiding me to the light with your endless wisdom. Happy Birthday! No matter how old you get in the flesh, in the soul, you still are as young as ever! Happy Birthday! The older you get, the more stories you gather so you can brag to your grandchildren! So no worries, you still have a lot to go! Happy 70th Birthday! As I was growing up, you always were the person everyone came to for advice, like an elder to a village, like the wise man of the forest, you always were there to support us in every way you could, and for that, I thank you. Happy Birthday! I cannot believe how fast time flies by! You go to sleep when you are 25, wake up at 70. That does not mean though that you should be any less amazing as a father! Keep on being the funny and energetic person you’ve always been. Happy 70th Birthday! For every year you’ve lived, you grew even more amazing than the previous one. That means you are now 70 times more amazing than the time you were born! Happy Birthday! I could wish you for all of your dreams to come true, but seeing how happy you are around your grandkids, we both know that those dreams were accomplished long ago, so I’m going to wish you to never stop being amazing, and let you know how much we all love you. Happy Birthday! I know that your skin is all wrinkled and your hair is all gone, but your soul is still there, shining brighter than ever! Happy 70th Birthday! From the world’s best 69year-old, you now just magically became the best 70year-old! May you reach 100! Happy Birthday! Your amazing personality and funny stories from when you were young, make all these family reunions worthwhile, and the best thing is, that the older you get, the more and better your stories become! May you keep growing, and remain as amazing as you are now! Happy Birthday! You’ve lived through seven decades worth of adventures, happy and sad times! You deserve all the credit in the world, and may you live to see another 70 years! Happy Birthday! With this message, I send you 70 of my most warm hugs and kisses, and my best wishes for you to have the happiest of birthdays! If this day was an object, it would be a door, leading you to new adventures, that you will now face, one year older, one year wiser, and 70 years cooler! Happy Birthday! I want you to spend this day the same way you’ve spent the other 69 years you’ve lived so far, full of happiness and love! Happy 70th Birthday! You are now at an age where the mind runs faster than the body, and with an intellect like yours, your mind can still run for miles! Happy Birthday! I feel honored that I was able to see the marvels of nature from this close. Because the fact that you’ve remained this awesome for 70 whole years, can only be described as a miracle! Happy Birthday! You have to always look towards the bright side of life, at least now that you are 70, you get discounts at the supermarket! Happy Birthday! If everyone could be this energetic in their seventies, then this world would be a much better place. Keep on being amazing. Happy Birthday! Like a good bottle of wine or whiskey, you are not getting old, just well-seasoned! Happy Birthday! With a heart made of gold and a smile made of plastic, you truly are an extraordinary person. You are the living proof that age means nothing, it’s all in the soul! Keep on being this amazing for the rest of your life! Happy Birthday! 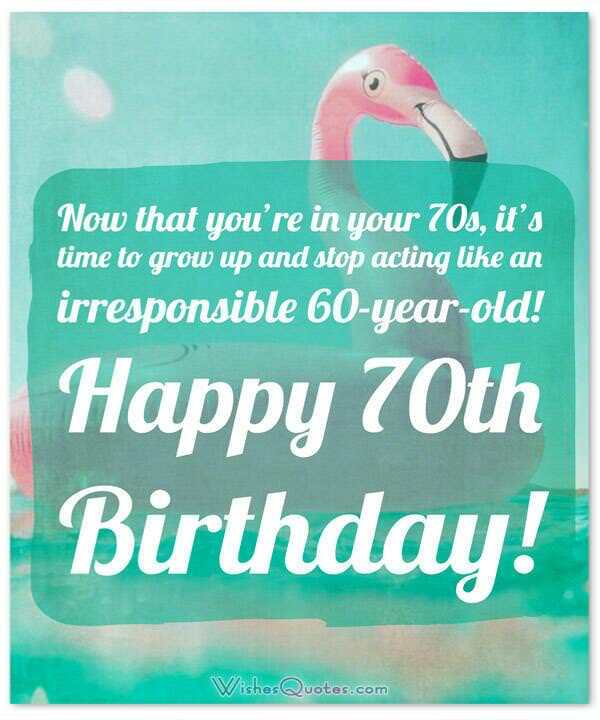 Now that you’re in your 70s, it’s time to grow up and stop acting like an irresponsible 60-year-old! Happy 70th Birthday! The problem with turning 70 isn’t so much that you slow down, it’s that the rest of the world doesn’t. 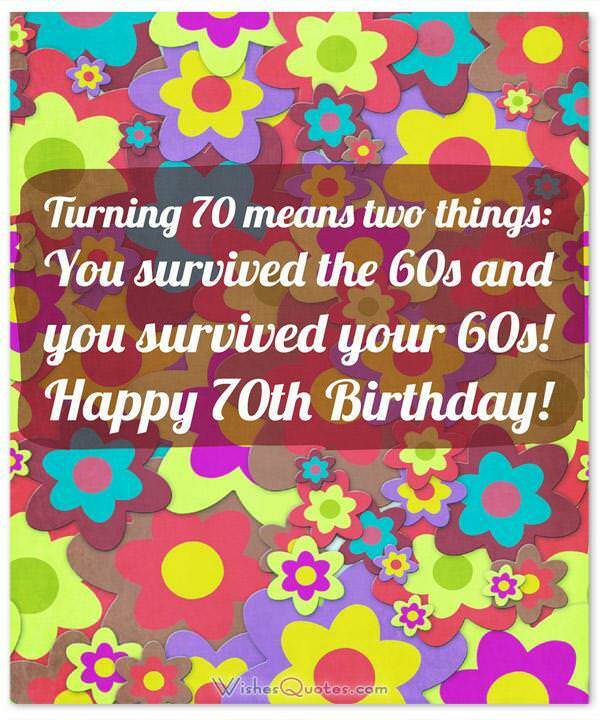 Turning 70 means two things: You survived the 60s and you survived your 60s! Happy 70th Birthday! Despite all the advances in medicine, there is still no cure for the common 70th birthday. When you hit your seventies, you start getting congratulated again for not having to wear a diaper. People say, “You did it! You made it to the bathroom!” Happy 70th Birthday!